5 Tips for an Easy Summer to Fall Transition! Knippenberg, Patterson, Langley, and Associates offers Group, Family and Individual Counseling in the Denver and Littleton Area. Specializing social skill groups and the Testing and Treatment of ADHD, Anxiety Disorders, Autism Spectrum Disorders (ASD), Learning Disabilities and of Childhood and Adolescents. 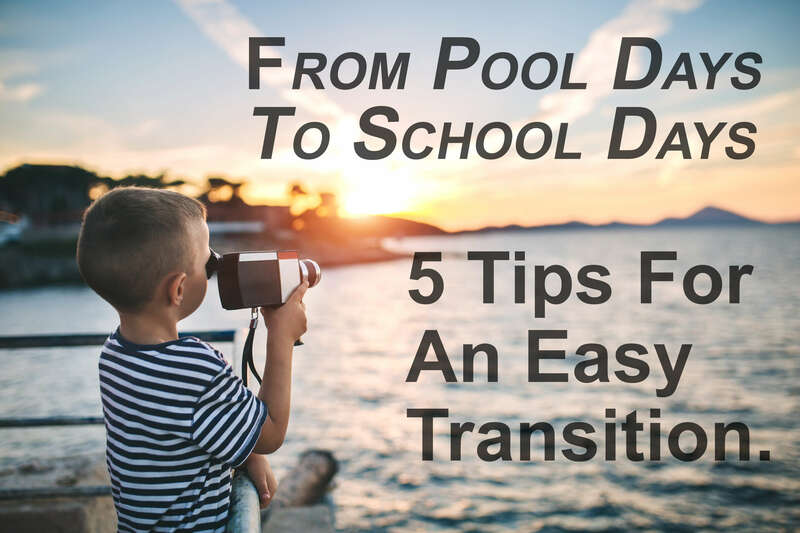 From pool-days to school days! It’s hard to believe that August is here and soon you will be transitioning from the pool-bag to the school back-pack. While there are still many days left to enjoy summer’s warm days and longer evenings, the school bell will be ringing soon! As the first day of school approaches, it is easy to feel frazzled by shopping for the ever-long school supply list, easing children’s back to school jitters and also, anticipating the return of routines and homework! To reduce the stress, here are 5 tips to help the last few weeks remain as stress-free as possible and kick off a great new school year! Start practicing the school year routines now! Waking up early and getting in the habit of getting dressed, eating and ready for the day will ease the first-day blues! This is especially true of children who are more sensitive to routine changes and feel upset when the predictability of their routine changes. Allowing this time gives them a chance to adjust, while still in the comfort of their home. Children with ASD (Autism Spectrum Disorder) and other sensory disorders may have even greater difficulty with a change in routine, so making smaller changes to your schedule over a time period may be helpful, rather than having an abrupt schedule change. Summer reading doesn’t always happen, and that’s okay. Not all children are excited summer readers and motivating them can be a real challenge. Audiobooks are a great alternative to reading and can get young readers excited about books that may be beyond their reading level. Research has shown that audio books help boost comprehension, fluency, vocabulary and decoding skills. Help your child get organized. Go through desk drawers, toss out dried markers, broken pencils, old scraps of paper and random crafts. Giving your child a simple, yet organized place where they can do homework will help to build good study habits through the school year and help reduce frustration. Children who have been diagnosed with ADHD (Attention Deficit Disorder) or have similar qualities may benefit in an environment with fewer distractions and simple organizational systems. Foster new and old friendships. Summer is a busy time of year, and it can be a challenge for school friends to play and spend time together. For children who feel anxious in new environments or those returning to an old one it can be beneficial to establish and nurture friendships so that when returning to school, they see some friendly faces who they feel comfortable with. Commemorate summer with a special activity. This technique helps the mental transition from one event to another. I.E., summertime, to school time. Having an ice cream at a favorite place, going on a late summer hike, or a special trip to a favorite play center are all fun ideas. Take a few photos together as a family celebrating this particular transition.